massive white poplar we removed at city park. A big job indeed. We strive for top notch customer service, competitive pricing and high quality work. 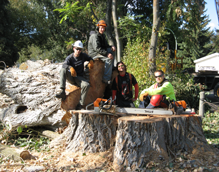 Our edge is dangerous tree removal but over the years this has extended to an array of services. We love what we do and this shows in our work and repeat customers. Give us a call today for your FREE estimate. 250-878-4092. Thank you so much for beautifying my yard. Your employees were considerate of both myself and the environment and worked very hard, sometimes upside down (Yikes!) and quickly. Greg and I are very pleased with the quality of your work. Should we need more help, yours will be the company we call. When Steve came by to give an estimate to take down a very large pine, arriving in shorts and sandals and looking quite young, we wondered whether he could really do the job but we liked his personality and found him very knowledgeable, so gave him the job, even though we were a little unsure of his ability. However, the day he came to take down the tree, he was in full safety and protective gear, and we watched in awe as he climbed that very tall pine and proceeded to do a thoroughly professional job. He was fast and efficient and we'd recommend him in a heartbeat for tree work. We called a number of different companies to look at dangerous tree removal we needed done in our backyard. Precision Tree was the only company that had equipment and the man power to get the job done safely. Steve is great person to work with and I would recommend giving them a call. Professional service with a smile. I am very happy with the work the crew got done and in such a timely manner. They recommendations have been a blessing for my yards well being. Wow it takes a certain type of person to do this dangerous work. When I spoke to Steve his pricing was very clear and he was ready to get the job done. Responsive and Professional. Would recommend. We had a number of large pines in our backyard that had been burnt during the fires. My husband did not want to cut them down until one crashed on our house! Steve was able to safely remove the other tree without any incident. I was glad I was working with such pros and my house could have be crushed. Give them a call. We have been providing the Okanagan valley with tree service for over 7 years. We specialize in dangerous tree removal. If it's a big job or a small job we have the experience, man power, and equipment to meet your requirements.